Robin Williams said something funny once. Who knows who heard it, but it must have been a zinger. It compelled him to try for a laugh again, and once the first domino fell we’ve been laughing ever since. He had a knack about him to exhaust even the listener. How could he think that fast? Talk that fast? And exactly how many voices were in his head, anyway? Because they could all come out in one smooth, mildly coherent monologue. He was genius in motion. He flung words like wet noodles against the wall and every one of them stuck. He left too soon, but, in comparison, his talent lasted so very long. Robin Williams gave us the dance of our lives before the music stopped. Of all the quirky, off-kilter, zany yet relatable lines Robin Williams spoke, one quote had more weight. In fact, it sunk to the sandy ocean floor. And there it sits. Robin (his relationship with his audience was too personal to call him “Williams”) saw things few do. And, during an interview with Diane Sawyer in 2006, he gave us a momentary glimpse inside the mind that baffled us. It came after a two-year relapse into alcoholism following 20 years of sobriety. It came two months after rehab, where he had admitted himself. It came days before “Man of the Year” premiered and, once again, audiences would flock to the unexpected dialogue of a man who couldn’t be held down by a mere script. It came after Sawyer asked if the last two years brought him sadness. Everyone loves the sound of laughter. But maybe Robin didn’t hear it like we do. Maybe he heard something different. Maybe when he delivered a line so crisp it could be snapped in half and loudly crunched, he heard a sound with a more angelic quality. Maybe, for him, all laughter was infused with a tinkle of glass and the gurgle of water. Maybe it boomed like thunder or rushed like wind. Maybe flutes and violins played in the background and, because he was Robin Williams, there was a tuba thrown in there, too. 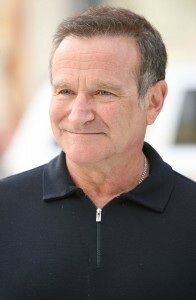 Maybe as much as laughter can lift our spirits, for Robin it lifted his feet off the ground. He was so entranced with laughter he dedicated his life to it. He brought it to hospitals and sick beds, to soldiers far from home and the homeless far from everything. He would take his talent to the darkest places in life and then open it up like a box of sunlight. Everywhere Robin went, he went for the laugh. And the laugh came running to meet him. This was his gift. It was how he gave to others. That is where the quote and the life collided. There’s a lot we don’t know about Robin. We do not know the struggle happening inside his mind or the pain of his battle. He kept that to himself. But we know he got one very important thing right: He knew life was about giving all of himself, even as quirky as he was, to serve others in only the way he could. That, and a loving God, was life. He knew it. And now we do, too. Thanks Robin for all your glory and humanity, your mistakes and stumbles, your humility and noise, and that one time when life was just too heavy that you made us laugh in spite of ourselves.